Don't you think a sweet birthday wish from your close friend makes your day a lot brighter? The reason we brought this up today is because Shah Rukh Khan's birthday post for his close friend Juhi Chawla is just too cute be missed. Juhi, who blows out 51 candles on her birthday cake today, shared a tweet, in which she expressed her excitement over hearing her songs being played on the radio. Juhi tweeted: "They're playing my songs on radio today! Yaay! Happy Birthday to me!" 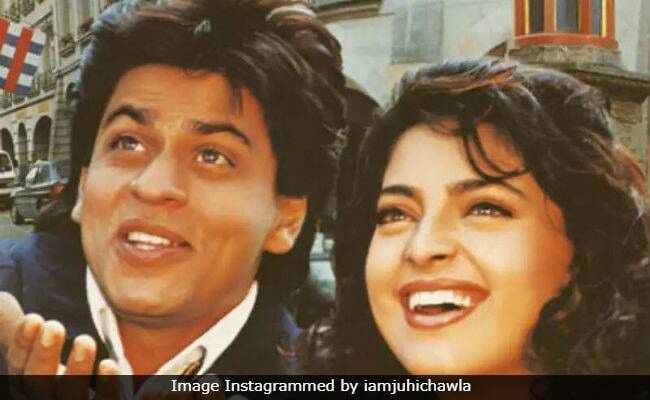 Now Shah Rukh Khan, who happens to be a close friend of Juhi Chawla and has co-starred with her in several films, responded to Juhi's tweet in the sweetest way possible. In case you are wondering, what SRK's reply was, he wrote this: "We play all your songs in our hearts. Happy birthday to my closest friend and family. Love you." It is a well-known fact that Shah Rukh and Juhi are close friends and that they have co-starred in several hit films in the Nineties. They worked together in films such as Darr,Raju Ban Gaya Gentleman, Duplicate, Phir Bhi Dil Hai Hindustani, One 2 Ka 4 and Yes Boss among others. Shah Rukh and Juhi were last seen sharing screen space in the 2008 film Bhootnath. How can we forget the epic throwback picture of Juhi and SRK, from the sets of Yess Boss. Juhi shared the picture on her Instagram profile a few months ago and wrote: "21 years to Main Koi Aisa Geet Gaoon. Sweet memories on and off screen. 21 years to Yes Boss today." On the work front, Juhi Chawla was last seen in the 2016 film Chalk n Duster, in which she co-starred with veteran actress Shabana Azmi. Juhi will next be seen in Ek Ladki Ko Dekha Toh Aisa Laga, co-starring Sonam Kapoor and Anil Kapoor. The actress is also expected to feature in a cameo in Shah Rukh Khan's Zero, which has been directed by Aanand L Rai.